a bed of thistles for my head to rest. a fool – oh yes a fool – indeed. envelop the night with their pungent scent. Then not liking the answer that lay about my feet? sweet is the surety ~ as only a great oaks love can be. waiting to be gathered in profusion! over the smouldering ends of a non perfect day. and I was the marrying kind. pass me that last, chocolate éclair. removing your horned rimmed glasses. your hair – and your gormless blank stare. they’re just so incredibly dumb! though nothing a good meal couldn’t solve. rising slowly from your eminent pose. stand the sentinel – sucking underfoot of duties need. pinning our bitterness to the tails of passing laymen. like the tiptoeing of the child who sneaks its way at night. given eagerly within the density of life. shedding my shadow, towards the downward slope of reason. the time when shapes disguise their mutilated belief. outside the words of caution – they that came, all a little too late. will it be when the roses stop their showing. forcing sincerely, into a cold hard malign. begins to mellow, towards their retiring end. when the writing is on the wall? when my rainfall fails to desist…? Who if anyone – will? 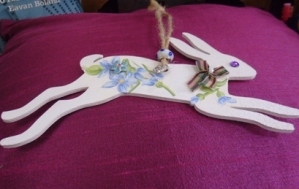 Mad March Hare In April. Sometimes when I am not writing poetry I love to decorate and make things. Here, as they say, is one I made earlier.